BITMAIN ANTMINER D3,the World’s Most Powerful Dash miner! Note: The price of dash mining machines must be adjusted frequently according to many factors, including Dash/USD exchange rate, the network difficulty, and expected difficulty increase. Refund requests based on price changes cannot be honored. PSU: A power supply unit is not included. You will need an ATX PSU with at least 9 six-pin PCIE connectors. There are 2 PCI-e connectors for +12V DC input on each hashing board and all 2 are required. Do not connect more than one PSU to the same hashing board! 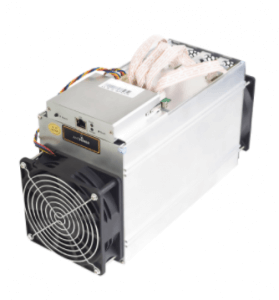 We recommend the APW3++1600w power supply for use with the Antminer D3. One power supply supports one Antminer D3. Separate power supply to control board: there is one additional 6pin PCI-e connector on the IO board which must be connected to the PSU to get power. Be sure to power on the miner only after all the 9 PCIE connectors are connected to power supply.